FastPictureViewer | View topic - How to: Quickly open the image folder picker? How to: Quickly open the image folder picker? Just hit Ctrl+Q on the keyboard. This will bring up the folder selection dialog box. The program will propose the last folder that was browsed. Don't miss the tutorial page for extended coverage of FastPictureViewer Professional functions, video tutorials and an extensive Getting Started guide! Re: How to: Quickly open the image folder picker? 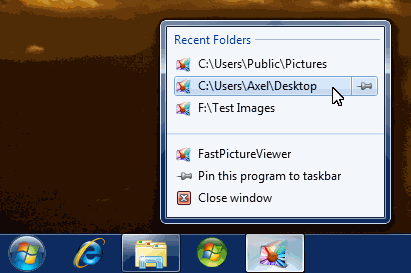 If the user "pins" the program to his/her Windows 7 taskbar the Recent Folders list is available even when the program is not running, thus it becomes possible to launch FPV directly on a recently used folder... nice!